1952 Ohio Registration/inspection sticker TRUCKS - $20.00 : Bob Hoyts Classic Inspection Stickers, Add a Final Touch to your Restoration! This amazing 1952 Ohio sticker is completely different from any other Ohio stickers. 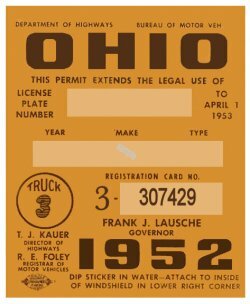 This sticker was issued to Ohio trucks, not including farm trucks which were even different. This sticker is priced at $15.00 but would come with blank panels. To place your own license plate number and YEAR/MAKE/MODEL on front can be ordered for an additional $10.00. (The sticker will look much better if you take advantage of this. Remember to add your year, make and model with your plate no. Ohio never had a mandatory statewide inspection program before 1966. In 1966 Ohio began voluntary inspections that continued to this day. This sticker was originally a water slide sticker but ours has our patented "Peel and Stick" feature that allows you to attach it to the inside passenger side of your windshield.